The store “Rus-mil.com” is happy to offer its customers a product that many outdoor enthusiasts have been waiting for so long for which the arrival of winter with its frosts, winds and blizzards is a new season for bright fun and entertainment. We are pleased to present you a set of winter camouflage clothing "Gorka", designed and manufactured in our own production. This suit will be of interest to hunters and fishermen, tourists and lovers of military games, rangers and foresters, geologists and oil and gas industry employees. It is designed for operation in conditions of moderate and severe cold, but the most important thing is that this suit is windproof, which means that it will adequately show itself not only in calm, but also windy weather. "Gorka" in this embodiment is great for wearing in the mode of low and medium activity. This means that you can spend a long time in the cold without feeling the cold and the slightest discomfort. 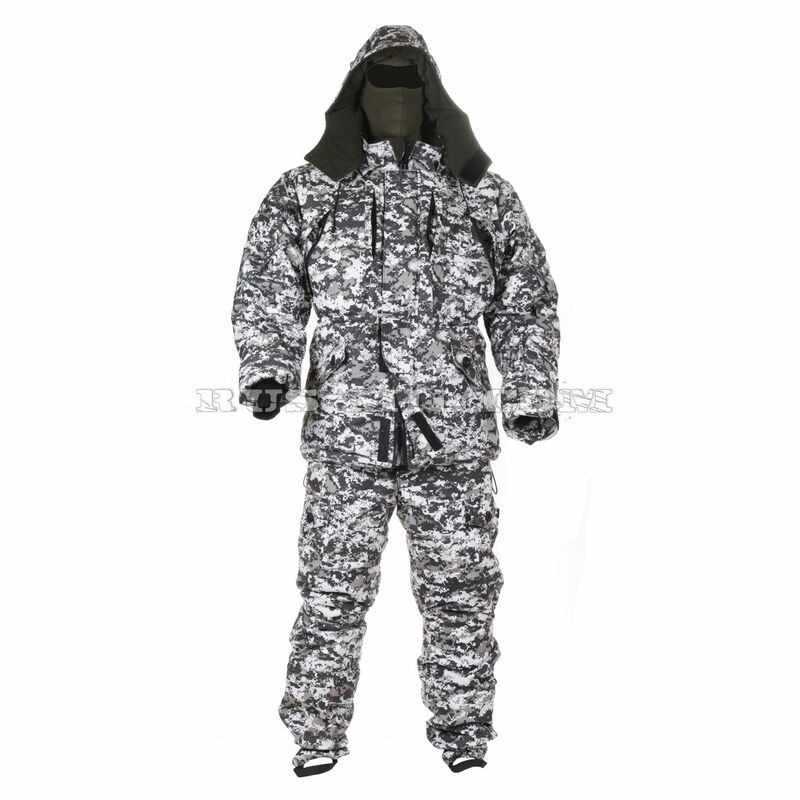 If you are fond of driven hunting and you often have to stand on your room for a long time waiting for game, if you prefer to beat the beast from an ambush and spend hours waiting for it at the trail, regardless of bad weather, then the Gorka suit in this design will suit you perfectly. We recommend it to the fans of winter fishing, who are able to spend hours on the spot with little or no movement, waiting for the cherished bite. The winter version of the “Gorka” suit from the store is made of quality materials. The kit perfectly protects against wind, thanks to the special material of the top. The outer insulating layer is made of a membrane with a knitted coating. The front side of the material has a pile texture. Thanks to the velvety coating, this material does not rustle when crushed. The membrane layer is not blown by the wind, but, nevertheless, is vapor-permeable. The suit can be stored in a tightly packed backpack, but after extraction it will not look wrinkled. A non-woven fabric of the category “soft” was used as a heater in a jacket and trousers. Its distinctive feature is the absence of excess volume, which is capable of creating inconvenience in the course of operation. 100% holofiber consists of a spiral-shaped hollow, highly curved polyester microfiber. Such a canvas is hypoallergenic, it does not collapse, does not clog, does not get off, is treatable without losing the basic properties and qualities. This is a breathable material that provides high-quality thermoregulation, which excludes the formation of zones with different temperature indices under clothing with such a filling. A product with holofiber, even after prolonged use, does not lose its shape. The lining of the jacket and the trousers "Slides" combined. In the area of ​​the torso, the jacket is trimmed with a fleece from the inside, and the sleeves with an old-good taffeta. This version of the lining provides easy donning of the jacket – hands go into the sleeves without difficulty. Fleece is designed to ensure the absorption of excess moisture, which is excreted by the human body during high activity. Even a wet fleece does not stop breathing and keeps warm well, and besides it dries quickly. The same combined lining is also available for the trousers: they have fleece to the knees, and below – taffeta. Creating their winter suit “Gorka”, the developers set a goal to make a high-quality, most functional windproof suit for outdoor activities. This means that such a set should show itself in a variety of situations only from the positive side. For example, in this “Hill” you can safely ride a snowmobile even in a hard frost, without risking to freeze and catch a cold. The jacket has a great hood that fits on the face contour and volume. This headgear will not break the wind or a tree branch. Trousers split at the bottom. In fact, this is such a boot: you can fill one “inner leg” in the boot, and the outer boot on his bootleg from above. Thanks to the retainer from the textile tape, such a pant leg will never pull out of the boot or cuddle.